It has been a while since I got my hands on a gadget to review that was this well-rounded. 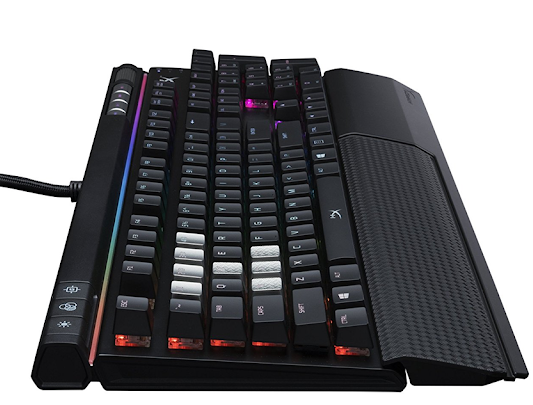 Built with the gaming community in mind, this particular keyboard has a host of features that indicate this was a carefully considered device. The light bar along the top of the keyboard certainly is a fresh take on illuminated keyboards, but there are a lot of really smart design choices in other areas that help the HyperX Alloy Elite RGB Mechanical Gaming Keyboard stand out in a crowded field. This particular model is a good old-fashioned Cherry MX Red keyboard, and the most important factor in any keyboard purchase is how responsive the keys themselves are. Rest assured, that primary focus is fantastic here, with keys that are appropriately fast without the tactile bump that many twitch-responsive gamers are looking for. The switches on this keyboard are incredibly accurate and durable as well. I did a lot of typing with this to try and make sure that there were no errors or defects, but I never once encountered a misfiring key. Also, with a review, it can be hard to read durability in just a few days or weeks, but I do a lot of typing throughout my day. It is not an exaggeration to say that with my work I press thousands of keys in a given day, and there was no sign of wear and tear over the time I spent with the keyboard. This feeling of quality is further enhanced not just in the key responsiveness, but the overall build of the keyboard. This is a pretty hefty keyboard - the first thing I noticed when picking up the box. I can appreciate wanting a lightweight keyboard, especially when someone like my son has a tendency to play with it in his lap in his chair. However, those lightweight models can give the impression that they are cheaply made with how lightweight they are. I had no such thoughts here, as the solid steel frame made this arguably the sturdiest keyboard I have used yet. Another small but nice design touch is the detachable wrist rest. I am a sucker for these, because for all of my typing, my wrists do have a tendency to sag after a few hours and while I do have my own standalone wrist wrest, I can appreciate a keyboard that offers one. I like it even better when it can be removed and is also coated with a sort of soft surface that makes it more comfortable than some of the hard plastic ones I have encountered in the past. The design of this keyboard is one with buttons in mind. It is a full sized one, with a number pad on the right and media / quick access buttons along the top as well. There is a second USB cable you can use to provide a 2.0 pass-through for those who prefer to have headsets or a mouse hooked up to your keyboard as opposed to draping cables separately to the PC itself. 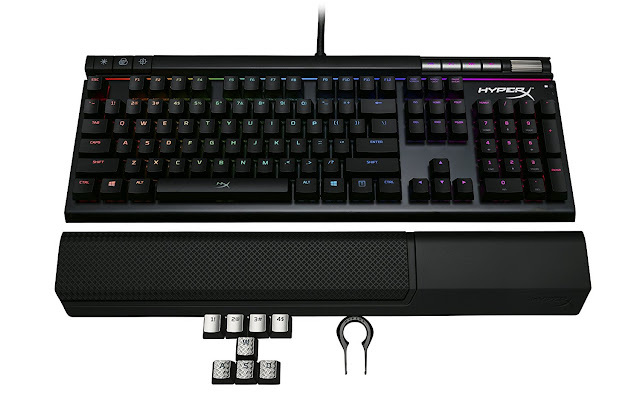 All of these are pretty standard features, but I prefer a fully featured keyboard and the HyperX Alloy Elite RGB Mechanical Gaming Keyboard certainly is that. The one other interesting innovation is a purely cosmetic one, but the light bar across the top provides just a bit more illumination and when combined with the NGenuity software, offers a bevy of customisation options. Admittedly, I tend to be pretty simple with my colour schemes and light patterns, but my son certainly enjoyed tweaking them and there were some admittedly pretty cool options in there. On the functionality side of the house, more of the usual features you would expect like N-Key Rollover and anti-ghosting are present. Rounding out the gaming features, the on-board memory not only provides macros, but up to three different profile settings. So I can light and play my games my way, my son another and we don't have to change anything when we switch back and forth - a nice time saver overall. 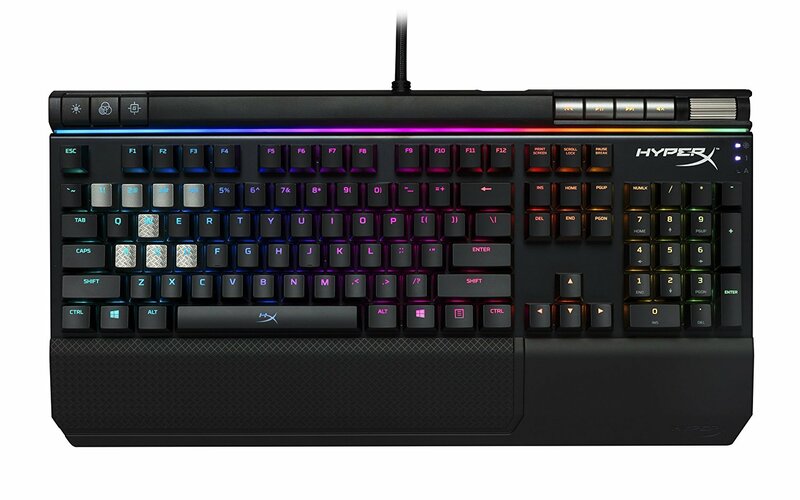 Admittedly the price point for the HyperX Alloy Elite RGB Mechanical Gaming Keyboard could be a bit high for those not looking to make use of the gaming features (it lists for $169.99 right now on Amazon as of the writing of this article), but if you are looking for those extra gaming features, this particular keyboard is every bit as good (if not better) than some of the higher priced options out there as well. Combine that with a sturdy yet stylish design, comfort and keys that are lightning quick in their responsiveness, and the HyperX Alloy Elite RGB Mechanical Gaming Keyboard is an excellent option for those looking for a high-end mechanical keyboard.